Our annual mass will be held at on Saturday 3/9/19 at 11:30 am at St. Francis of Assisi, Mount Kisco, NY. Reception to follow in church. The St. Patrick's Day Parade Committee is pleased to announce the 29th annual Parade will be held on 3/9/2019 at 2 pm, Main St. Mount Kisco, NY. Marching Groups should assemble at 1:15 pm off Moore Avenue. on your assigned side street in the same order as listed on program. Bus ride for marchers is on Green St. Bus driver will have Line of march program on board. For parade marchers park in lot by Green Street, a bus picks up marchers in front of Mount Kisco fire station. Arrive early to allow time to park, ride on bus to lineup location, and form up. The national AOH is celebrating its founding 183 years ago in 1836 at St. James Church on James St. in Manhattan, NY. FIRST DIVISION Form @ Spring St. /Moore Ave.
THIRD DIVISION Form @ Boltis St./ Moore Ave.
Mount Kisco Volunteer Ambulance Corps. 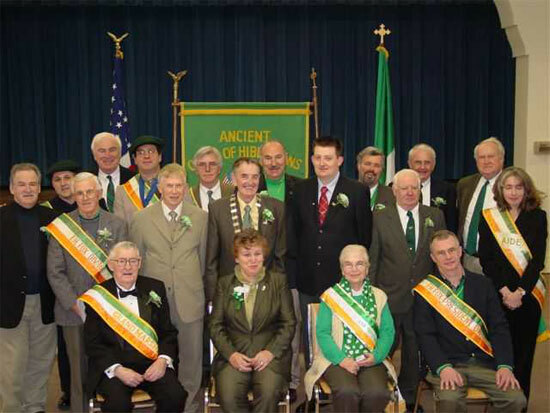 The Ancient Order of Hibernians, Division 16 , a non-profit organization was formed on September 13, 1891 consisting of men of Irish descent and practicing Roman Catholics living in the Northern Westchester area. 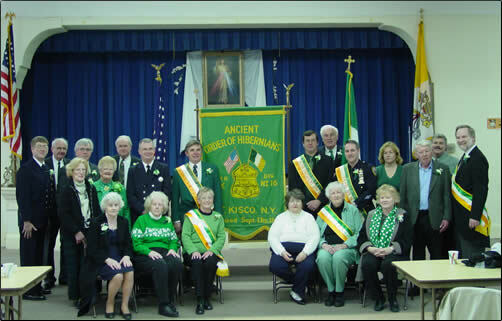 The division has a long and distinguished history of serving different community groups in the area as well as hosting northern Westchester County’s annual St. Patrick’s Day Parade in Mount Kisco, New York. The annual parade results in a positive image for Northern Westchester and benefits area businesses in Mount Kisco. Membership is also available for the Ladies Ancient Order of Hibernians. The A.O.H. seeks to promote friendship, unity, and Christian charity. Throughout the year the division raises thousands of dollars for local groups such as the Boys and Girls Club of Northern Westchester, Hospice of Northern Westchester, and Rosary Hill Cancer Center. The A.O.H. originated in America in N.Y.C. on May 4, 1836 in order to protect the Catholic Church from a mounting wave of religious bigotry, discrimination, and mob violence. In April 1844 the AOH valiantly defended the old St. Patrick’s Cathedral in NYC from being burned down. Division 16 meets on the second Wednesday of the month at 7 p.m. For further information or an application, please write: AOH P.O. Box 473 Mount Kisco, NY 10549. Application can be printed out from this website. The A.O.H. originated in America in N.Y.C. on May 4, 1836 in order to protect the Catholic Church from a mounting wave of religious bigotry, discrimination, and mob violence. In April 1844 the AOH valiantly defended the old St. Patrick’s Cathedral in NYC from being burned down. 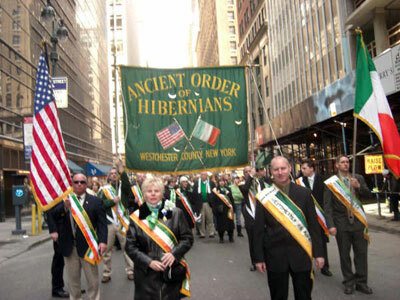 The Ancient Order of Hibernians - Division 16 meets on the second Wednesday of the month at 7 p.m. Meetings are held at the American Legion Hall 1 Legion Way Mount Kisco, NY. Come join us!